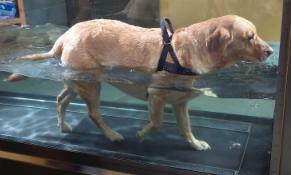 Hydrotherapy is the use of water as an aid in the recovery and rehabilitation of an injured animal. 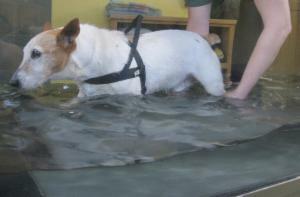 At Meadow Farm we use the Aquatic Treadmill for hydrotherapy treatment. The Aquatic Treadmill is the most flexible water therapy treatment available. There are many properties of water that make it beneficial as an aid in rehabilitation. It is crucial that the water used for hydrotherapy is kept at the correct temperature, this prevents the body from cooling on immersion and also prevents over heating during exercise. This thermal effect can warm superficial joints during exercise and maintain circulation, important for both soft tissue injuries and arthritic joints. 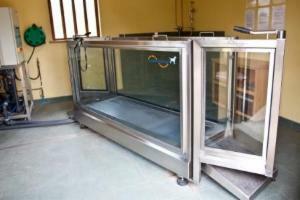 In the Aquatic Treadmill we have the ability to alter the water height to provide varying buoyancy and weight bearing, allowing the limbs to move freely without carrying the full weight of the body, from fully non-weight bearing to full weight bearing. Again this is variable in the Aquatic Treadmill as hydrostatic pressure in creases with the depth of the water, this pressure can be varied and controlled by altering the height of the water. Hydrostatic pressure is of great beneficial, when treating animals with reduced balance, for example neurological conditions, as it helps stabilise the body. Dogs with non related clinical conditions also benefit, such as respiratory and heart conditions where reduced pressure on the chest is preferable. Hydrostatic pressure also reduces an animal’s perception of pain allowing them to perform movements in water that they find difficult on land. The cohesive force is greatest at the surface of the water, the force required to break the cohesion leads to increased resistance and surface stimulation this is particularly relevant with the adjustable water level in the Aquatic Treadmill and allows us to increase workload in a specific area/muscle group or joint, whilst also protecting a specific area if required, for example post surgically. Viscosity and turbulence at the surface of the water play an important part in sensory awareness, reaction time and stabilisation. This greatly influences proprioception (the unconscious perception of movement and spatial orientation) gait patterning, dogs often don’t benefit from this when fully immersed below the water surface whilst swimming. In the Aquatic Treadmill as we vary the water height used it will determine the flexion and extension angle of a specific joint, generally flexion is greatest with water at or above the joint of interest and extension is greatest with water below the joint of interest; it is not possible to fluctuate this whilst swimming and a valuable benefit can be lost. Neurological conditions:Fibro-cartilginous embolism (FCE) Intervertabral disc protrusion, Cervical vertebral malformation, spinal injuryand trauma. The Aquatic Treadmill is particularly well suited to treating neurological conditions as it is designed to allow a therapist to stand within, giving support, whilst facilitating movement and optimising gait changes during the session. All assessments are carried out by a fully qualified Veterinary Physiotherapist who oversees the treatment programmes and carries out regular reviews for all our patients. Initial appointments are arranged for 1 hour 30 minutes with follow up appointments being 45 minutes. 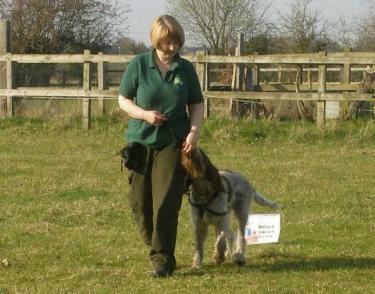 We are always happy to discuss your dog's requirements please give Rachel a call to chat. We are only able to treat your dogs after a formal veterinary referral, please download our referral form here. Rachel has over 20 years experience of working with animals first within veterinary practice and as a hydrotherapist for 16 years. Rachel is a qualified hydrotherapist, holding the nationally accredited ABC Certificate in Hydrotherapy for Small Animals and a qualified Animal Behaviour Specialist holding the COAPE Diploma in Companion Animal Behaviour and Training. Rachel also holds the Pearson BTEC Certificate in Education and Training.